"I will be joining the climb in this coming november which is unfortunately the raining season. Is it advisable to bring my Canon Powershot SX40 HS (weighing appx 600g) for the climb? Which i will be lugging it along my neck for the whole climb." Whether raining season or dry season, as I understand, it always rains. We need to make our choice between the chance of taking good photograph versus possibility of spoiling our camera. For me, I brought my camera along my climb despite knowing it was probably going to rain along the way. Most of the time, during both of my climbs, my SLR camera was hanging on my neck. During heavy rain, it went into my water resistance backpack and covered under raincoat. Here are a few things you should bring to keep your camera dry. A water resistance backpack. I think most backpack are water resistance. During heavy rain, put your camera in the water resistance backpack. A very light raincoat that can cover your head, your body and your backpack. When there is rain, cover yourself and your water resistance backpack inside the raincoat. Now there are two layers of water resistance. Wear a water resistance windbreaker jacket. In a drizzle, you still can hang your camera on your neck, yet hide it inside your water resistance jacket covered under raincoat. But be careful, sometimes rainwater can find its ways from your face and neck and go inside your raincoat and jacket. During your night climb, right before Sayat Sayat, there is a stretch of trail that requires you to use both hands to hold a rope while walking on a ledge. Your body will slant slightly forward on the rocky surface of mountain. You will not want your camera (which is hanging on your neck) to knock on rocky surface. You can either put your camera back to your backpack OR continue to lug it on your neck, put it inside your windbreaker jacket and zip up the jacket. After Sayat Sayat checkpoint, there is a stretch of route before 8KM (approximately 3800 meter above sea level), you will probably feel very tire due to the height, steepness of the trail and lack of oxygen. The 600g camera suddenly becomes very heavy. You probably regret why you ever want to bring this "bulky" camera to this mountain. In my first climb, at that very moment, I did regret. But it is all worthwhile to bring your camera right to the peak and down. Descent from summit to Laban Rata is the most scenic part of the climb. I enjoyed so much of the scenery that I was very reluctant to snap photo spoiling the moment. Then I regretted of not taking enough photograph. But it was so beautiful at the summit looking downward. Shouldn't I just experience the moment, absorb all the grandeur views of the mountain into my eyes instead if snapping photo? It is dangerous to walk, to enjoy the scenery and to snap photo all at the same time. You can twist your leg easily if you are not careful during the descent from summit. So be careful. In general, there are two ways to book a travel package to climb Mount Kinabalu. There are pros and cons for each way. You can book your climb directly through the national park's sole operator, Sutera Sanctuary Lodge ("SSL"). It offers a standard 3D/2N climbing package that includes foods and accommodations. The price is cheaper than those offered by travel agencies. However, you need to book your place 6 months before the climb and the package does not include transport from/ to the airport to/ from Kinabalu National Park. Alternatively, you can book climbing package from travel agencies who bought bulk places from SSL. It is slightly expensive, but it includes transport to and fro between airport and Kinabalu National Park. This will be a better option if you don't want to worry about arranging transports and local guides. It also gives more choices of tour's itinerary. And this is the only option if you urgently need a place to climb Mount Kinabalu in less than 6 months. So, where can you find the travel agencies offering Climbing Mount Kinabalu Packages? They usually advertise on internet. For instance, there are four ads below this paragraph and a few more at the left panel of this page. You can refresh this page to view more offers. You can book your climbing place through their websites, email them or call them. The staffs are able to speak English. You can check them out. Alternative, you can search for travel packages to climb Mount Kinabalu using our custom search box below. Just search for "climbing Mount Kinabalu package". There should be at least 8 to 10 travel agencies showing their tour packages to climb Mount Kinabalu. The rate quoted for 3D/2N climbing package in 2011, when I climbed the mountain, was RM452 per person (in a group of 7 travelers) (include accommodation & all meals), RM30 per person climbing permit and RM RM7 per person insurance. In total, RM489 per person. This year, 2012, a traveler reported in lonely planet, that the cost had increased to RM728 per single traveler, RM100 per person climbing permit and RM7 per person insurance. In total, RM835 per person. It seems SSL's price has been increasing for the last few years. One compulsory mountain guide (RM100) per group of maximum 4 climbers. You can book for an extra night stay in the park after the climb. We stayed in Nephenthis Lodge and we simply loved the place. The price is affordable as we went in a group. Talk to your transport driver if you want him to recommend you places to visit. They are usually happy to detour for a fee if the detour does not jeopardize your timing to climb or back to airport. Climb permit, insurance, park entrance fee, return shuttle from Park's HQ to Timpohon gate, mountain guide, etc. There should be no extra cost. However, things vary depends on the climbing package that you order. Please check clearly before you place your booking. some offer more places of visit, i.e. islands hopping & scuba diving at Tunku Abdul Rahman National Park, Poring Hot Spring, white water rafting at Padas river, etc. Check out the climbing Mount Kinagalu packages offered by various travel agencies. You can see Laban Rata Resthouse at the bottom. But it is still quite a long way to reach Laban Rata. You can't see this at night when you climb up. This is the stretch after Sayat Sayat before reaching Laban Rata during your descent. Very near to Laban Rata now. Leave Laban Rata as early as possible. Chances of rain is higher at the later part of the day. The first 3 km is an easy climb. It is not steep. However, do not rush, walk at a consistent speed that you will not pant. Bring one set of dry cloth in your backpack in case you reach Laban Rata hours earlier than the porter who carry your luggage. After KM 3, be aware of your body response toward altitude sickness, i.e. headache, dizziness, vomiting, loss of balance, etc. As altitude sickness commonly occurs above 2,400 meters (8,000 feet), which is approximately at KM 3 onward. From KM3 onward, the slope becomes steeper. Calculation of slope for each KM of walk. The higher the value the steeper the slope becomes. For instance, the slope from KM3 to KM4 is 0.30 which is steeper than the slope value of 0.22 from KM 1 to KM 2. Last KM before reaching Laban Rata is long and tiring. The road from 5.5KM to 6.0KM seems never ending. Generally the trail from Timpohon Gate to Laban Rata is safe. You will not slipped and fell off the trail or fell off the cliff. The climber walks on jungle trail most of the time. There is no cliff. At times, there are wooden fences on the trail that next to a slope. (For those who live in Klang Valley and have chance to climb Bukit Gasing: Climbing from Kinabalu Park Headquarters to Laban Rata is not more difficult that the last 300 steps of Bukit Gasing. The trail before reaching Laban Rata is just like Gasing trail, except for the last KM. In the last KM of Summit trail, you walk on stones/rocks. Follow the link to see all the terrain photos of Summit Trail from Timpohon Gate to Laban Rata. 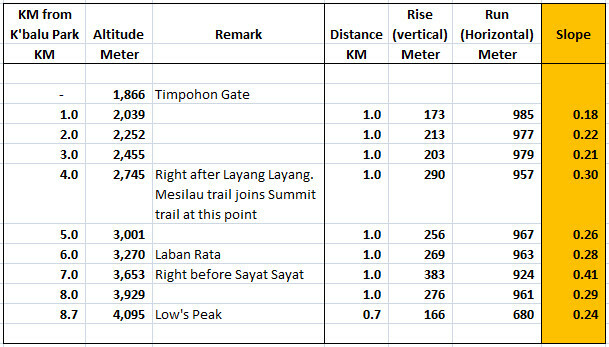 As you can see from the table above, Laban Rata to Sayat Sayat 6KM to 7KM is the steepest part of the climb. First half of this 6KM - 7KM summit trail is okay. The climber just walks up wooden staircases and stones. It can be tiring as the climber is climbing this part of the trail at 2.00 am before dawn. In the second half of this 6KM - 7KM summit trail we need to follow and hold a white rope. Normal carefulness will be good enough. At one very short stretch of trail, we need to use both hands and legs. Ensure guide is around at the steep angle area before passing this area. Night climb before reaching Sayat Sayat Checkpoint. How it looks like in the daylight. Sayat Sayat is the last toilet stop, don’t miss this toilet as it is still a long way to reach Low's Peak and back to this check point. All climbers must reach Sayat Sayat Checkpoint before 5am to be allowed to continue their climb. The gate closes at 5am. The stretch right after Sayat Sayat is the most difficult part of the climb. The slope is steep and the air is thin (only 62% of oxygen available at sea level). Many people reported to have thought to give up. After 8km, all the way up. It is easy to sprain your ankle on the steep slope if you are not careful. We stayed another night at Nepenthes Lodge at Kinabalu Park Headquarters after the climb in my second climb. Staying a night at Kinabalu Park after the climb gave us a much needed rest and a less taxing schedule. It is a fine lodge with 2 family size bedrooms, a living room, a kitchen and a dining room. All transports within Kinabalu Park Headquarters are free. We just need to call the operator to send a driver to fetch us to anyway in Kinabalu Park Headquarters. 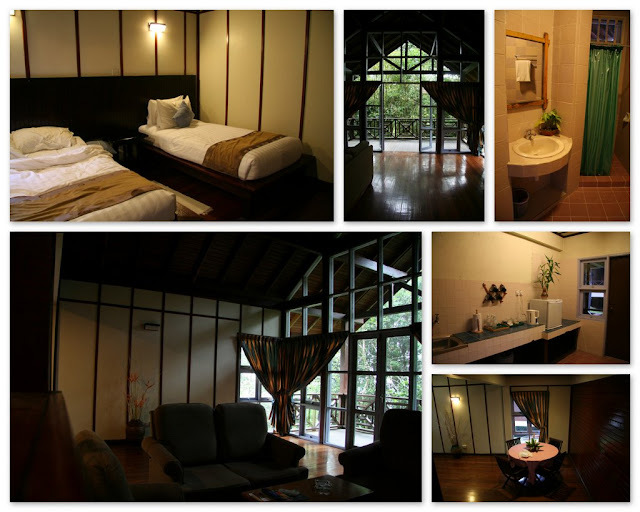 In September 2011, SSL charged RM685 per night per lodge. It includes two big rooms with master beds. It is good enough for 4 adults and a few more children. I am not sure what is the latest price now. The entire journey of climbing Mount Kinabalu is a long uphill walk. There is only an approximately 50 metres stretch of trail near the summit that you need to use your hands to hold a rope. Yes, I mean walking and not rock climbing. Technically it is an "easy" climb and that you don't need to perform rock climbing. Just WALK. Climb from Kinabalu Park Headquarters to Laban Rata Resthouse. This is either a 6km hike (walking upward) if you start from Timpohon Gate or an 8km hike if you start from Mesilau Gate. Climb from Laban Rata to summit, 2.75km, and descent back to Laban Rata, 2.75km. Descent from Laban to Kinabalu Park HQ, 6km to Timpohon Gate. 3pm: Reach Kinabalu Park Headquarters. 6pm: Buffet dinner at Balsam Cafeteria and stay one night at Grace hostel. 7am: Buffet breakfast at Balsam Cafeteria. Collect your packed lunch. By 5am: Sayat-Sayat checkpoint gate closes at 5am. Climbers must cross this checkpoint by 5am. By 6.30am: Reach Kinabalu Park, have buffet dinner and leave for airport/ Kota Kinabalu, etc. Some choose to stay one more night at Kinabalu Park Headquarters. In my second climb, we stayed one more night at a beautiful lodge, Nepenthes Lodge, at Kinabalu Park Headquarters. For Day 3, it is a 5.5km + 6km hike. It could take up to 14 hours of walking. Beautiful flora and scenery at Pondok Villosa, in the mid point between 4.5KM and 5.0KM. Read "How to climb Mount Kinabalu?"